When it comes to comfort food, breakfast reins supreme. The idea that sugar, butter, and starches are socially accepted as a meal uplifts my spirits. Or maybe it’s just the feeling of eating food after a long slumber that is most comforting. Whether you are eating a smorgasbord of goodies with good company at twelve in the afternoon, or a small pastry with a cup of coffee quietly by yourself before the rest of the world wakes up (reference to Truman Capote’s brilliant novella “Breakfast” at Tiffany’s), breakfast invokes a certain ambiance and has many characters that no other meals have. I believe in breakfast. 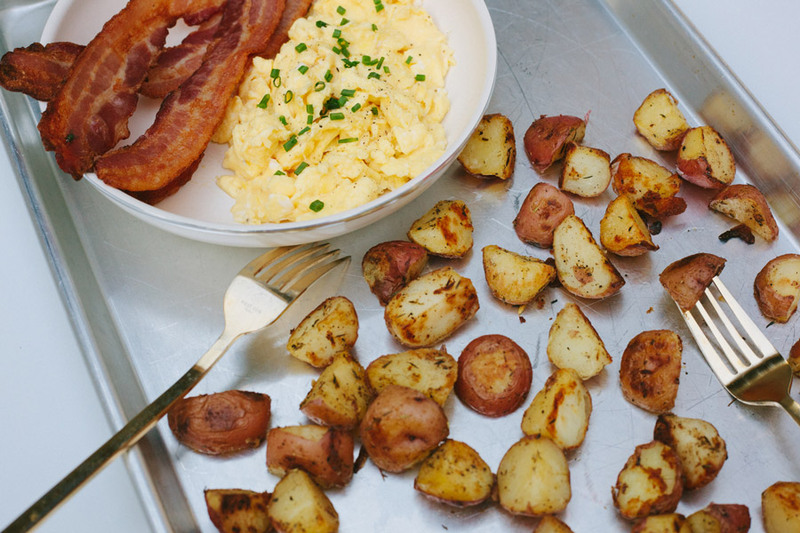 Eggs, bacon, and potatoes are all words synonymous to breakfast. 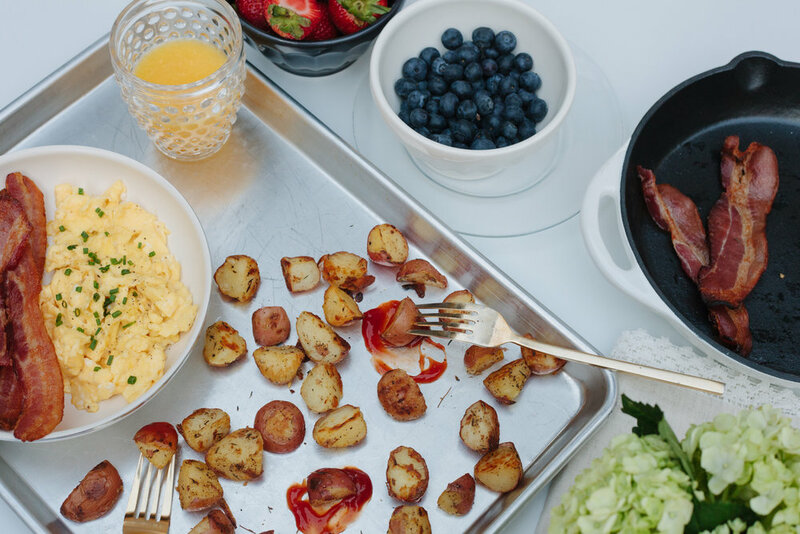 But instead of rubbery scrambles eggs, messy bacon, and greasy hash browns, our remake of this classic breakfast trio is certain to change your mind on the meal breakfast itself. First, cooking bacon in the oven is a no brainer. Instead of bacon fat splattered all over the kitchen, baking in the oven leaves no mess and perfectly cooked strips of bacon every time. Eggs and bacon are nothing without potatoes. Our roasted potatoes are full of flavor and perfect for any breakfast meal, not to mention they are great leftovers. Last but not least, our perfectly cooked scrambled eggs. Our recipe doesn’t call for any special ingredients; it is all in the “low and slow” cooking method. This method is a classically trained chef’s secret past down from James Beard himself. Cooking eggs over low heat creates the perfect texture and somehow adds secret ingredient flavor without a secret ingredient. 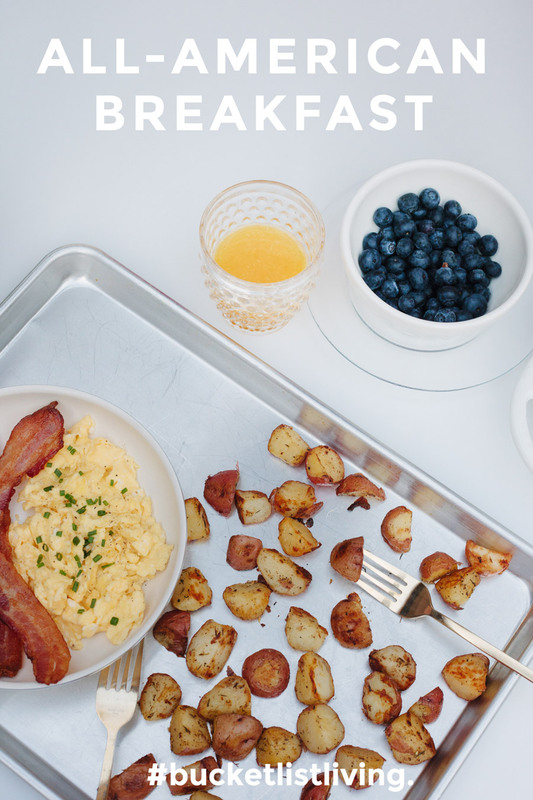 The All American breakfast is attractive with simplicity yet loaded with classic flavors. Preheat oven to 400 degrees. Place a sheet of parchment paper on a baking sheet, then lay bacon on top of the parchment paper close together but not overlapping. Place in oven and bake for 20-25 minutes. Drain on paper towels and set aside. Reserve bacon fat if wanting to use for potatoes. Cut potatoes in half or in quarters and place in a large bowl. Combine oil (or bacon fat), thyme, rosemary, garlic powder, salt, and pepper to potatoes and toss until evenly coated. Dump potatoes on a baking sheet in one even layer, then place in 400 degree oven and roast for 45-60 minutes or until golden brown and crisp tossing with a spatula halfway through to prevent sticking (If potatoes are drying out, add a tablespoon of oil halfway through cooking). In a medium sized mixing bowl, whish eggs, cream, and a dash of salt. Heat a large nonstick skillet over medium-low heat. Add butter allowing to melt completely without bubbling or browning. Using a heat-resistant spatula, continually stir the eggs and gently scrape the sides and bottom of the pan as soft egg curds begin to form. Continue this motion over medium low heat until eggs are done, but still have a shine and soft texture (about 20 minutes). Season eggs to taste with salt and pepper and garnish with fresh chopped chives. Enjoy breakfast! Preferably served with a hot cup of joe or freshly squeezed orange juice.